Is there a debt threshold that impairs medium term economic growth? The answer is no, according to a research paper by Andrea Pescatori, Damiano Sandri, and John Simon. They say that “Our analysis of historical data has highlighted that there is no simple threshold for debt ratios above which medium-term growth prospects are severely undermined. On the contrary, the association between debt and growth at high levels of debt becomes rather weak when one focuses on any but the shortest-term relationship, especially when controlling for the average growth performance of country peers. Furthermore, we find evidence that the relation between the level of debt and growth is importantly influenced by the trajectory of debt: countries with high but declining levels of debt have historically grown just as fast as their peers. 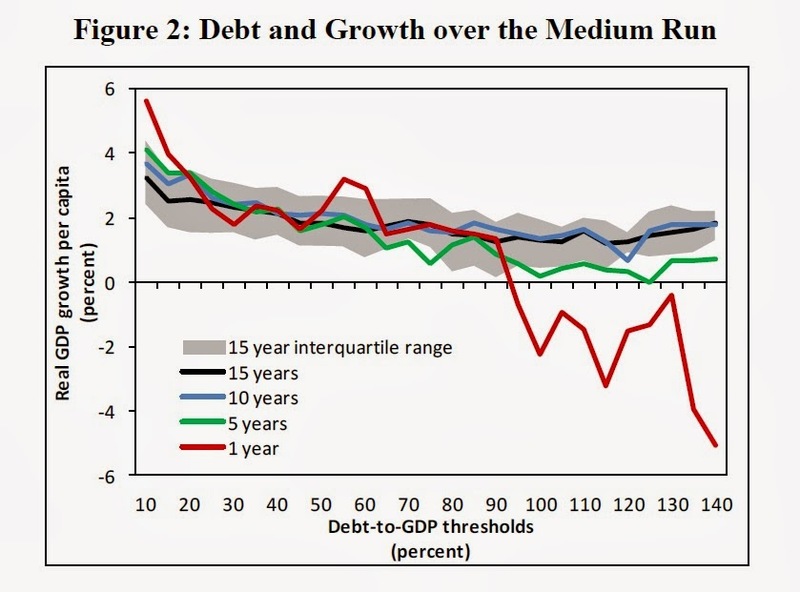 The fact that there is no clear debt threshold that severely impairs medium term growth should not, however, be interpreted as a conclusion that debt does not matter. For example, we have found some evidence that higher debt appears to be associated with more volatile growth. And volatile growth can still be damaging to economic welfare.